Air Force Staff Sgt. Bria Nelson had quite the dance partner last night. Nelson, who serves with the 579th Medical Operations Squadron at Joint Base Anacostia-Bolling, Washington, D.C., was selected to dance with President Obama last night at the Commander-in-Chief’s Inaugural Ball at the Washington Convention Center after the 57th presidential inauguration ceremony. Marine Gunnery Sgt. Timothy Easterling was selected to dance with first lady Michelle Obama. 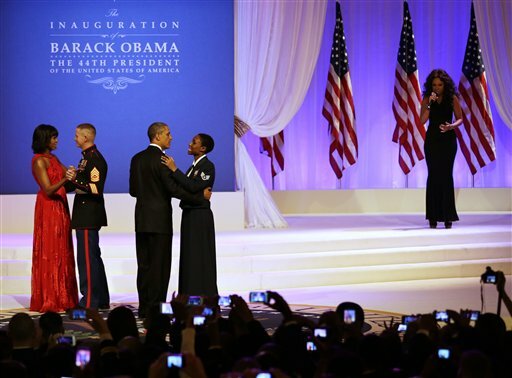 The service members and the Obamas were serenaded by Jennifer Hudson for the dance. The ball was the end of a long day of inaugural festivities, which included about 5,500 military members, including an Air Force band that marched in the inaugural parade.